Bayna Fast - High-Speed Optimized Blogger Template! If you're looking for a google page optimized blogger template, then Bayna Fast would be the first choice. A few months ago we're publishing another template named Bayna Responsive Blog Style Blogger Template. But at this time we are sharing another super fast blogger template with the same style. 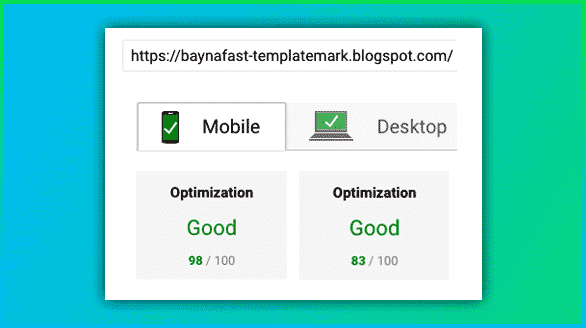 Bayna Fast is Page Speed Insights Optimized Blogger Template. Image size can increase your page load speed also. Image size in image optimization is very crucial. Image compression will be with any offline software or may in online image compression. After the recent Panda update, the loading time of web pages has become a vital part of your SEO ranking as the total time of visit has become more important as an SEO algorithm. That's why always try to use low bytes images in post page like under 50 KB. You may also optimize your image in online. In internet many web image optimizer is available. Attention: Bayna Fast support only Facebook Comment, not Blogger comment.